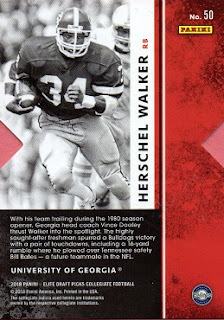 Some brand new Herschel cards came out this year under the Panini label. To the excitement of some, and the chagrin of others, Panini now has the NFL license for trading cards. Panini is known for featuring several parallels and inserts. 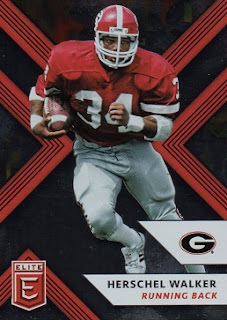 The 2018 Panini Elite Draft Picks set is made up of both current collegiate stars, and college heroes of the past, shown in their school colors. Herschel makes the cut in card #50 of the set. There are a total of 14 parallel cards of Walker to chase in this set. Basically, they're divided into two categories: Aspirations and Status Die Cut. In each category, there are seven different color variations. Orange, Purple, Red, Blue , Gold , Emerald and Teal. The serial numbered cards are Purple-99; Red-49; Blue-25; Gold-10; Emerald-5 and Teal-1, making of course, the Teal, the toughest to find. This card has the side die cuts(orange paper is background construction paper when I scanned it); and the serial number is printed over Walker's right foot, just above his name. 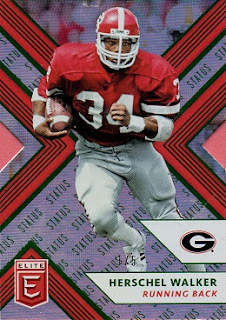 This card is #1 of 5. Some more parallels from this set are on their way to the Hoard. Nice to get such a low number out of the way early. Good luck with the hunt. Thanks Angus. Always fun to try and track down all the variations. Finally some new Herschel's to hunt. Good luck on snagging as many as you can. Have some fun!